Bitcore (BTX) - All Important Info: F A Q | 2nd Oct. 2017steemCreated with Sketch. A quick summary to answer all important questions regarding Bitcore. This post was created on 2nd October 2017. Please make sure to check my blog @xwerk for more recent updates before reading on. 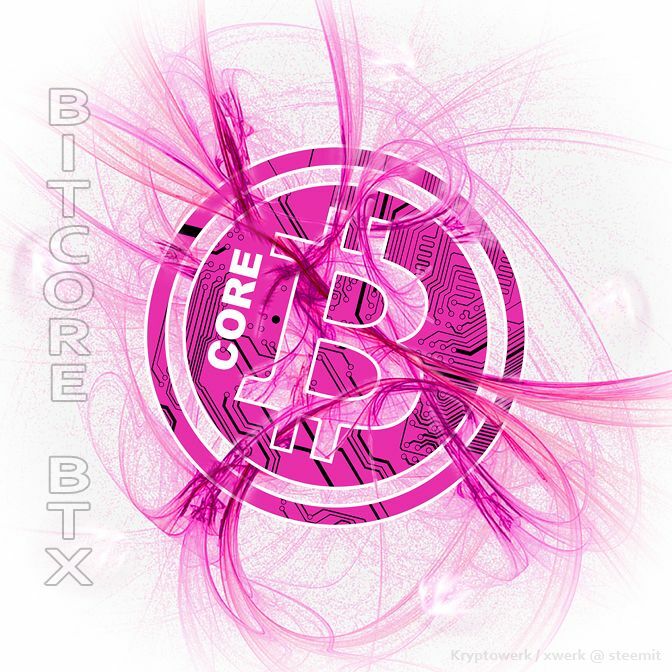 Bitcore BTX: F. A. Q.
Bitcore is a cryptocurrency born during the peak of the Bitcoin scaling debate in April 2017. It tackles both the SegWit and bigger blocks question by using 10 MB blocks, having SegWit integrated and running with a block-time of only 2.5 minutes. 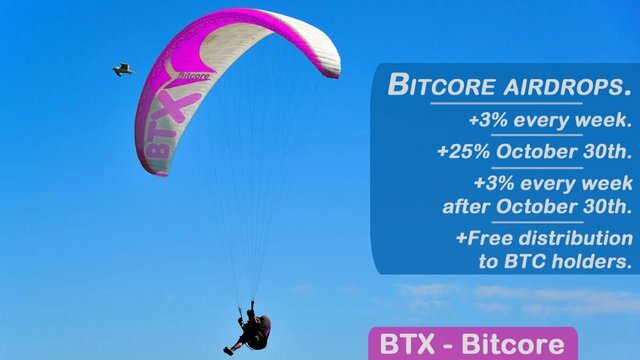 The project is called Bitcore and uses BTX as its abbreviation. It can be GPU mined featuring an ASIC repellant algorithm. Released by the talented developers of Bitsend. Free and fair distribution via claiming and airdrops. 2. What are the technical specifications of Bitcore? 3. How can I get BTX? Claiming: If you are a BTC holder, there is a great chance you can get totally free BTX. There are two snapshots of the Bitcoin blockchain that can enable you to claim free Bitcore. Airdrops: Currently airdrops are happening every monday. This is a free distribution or dividend of +3% or more for everyone holding 10 BTX or more in one address. 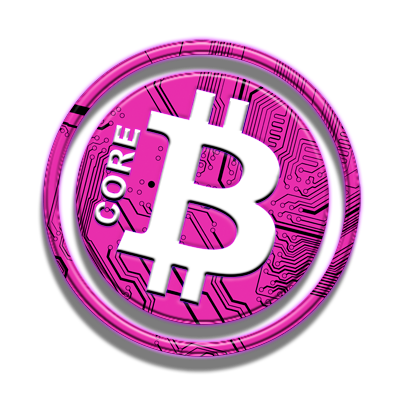 Mining: The network of Bitcore is decentralized and getting BTX via mining is as easy as with any other cryptocurrency. You choose a pool, set-up your GPU mining software and digg away! 4. Airdrops - How do they work? Currently airdrops are happening every monday, giving +3% to every address that holds at least 10 BTX. Additionally there will be a massive special airdrop with 25% on October 30th! These automatic airdrops will end on 2nd of November 2017. 5. BTX claiming - How does it work? 1:1 BTX to BTC if you had BTC on the snapshot @ 2017-04-26 17:10 UTC. 0.4 : 1 BTX to BTC if you will hold BTC on October 30th 2017, when a new snapshot will be taken. Watch this video by IMineBlocks on a detailed tutorial on how to claim your BTX. 6. How about about BTX mining? Watch this video by Mod Rage on a detailed tutorial on how to mine BTX with your GPU. Airdrops and most announcements are not final. This is a very flexible project with the developers keeping a close eye on the community and its wishes and needs. Adjustments can and will be made accordingly. Feel free to join any of the discussion groups (see useful external links below). Your input and support as a member of the Bitcore community is always appreciated. Also feel free to ask in the comments! I am in direct contact with the devs and can always forward important issues and questions. There are a few Bitcoin forks coming up (SegWit2x and BitGold). Bitcore already has all the features these project are promising to the people and has been running stable for five months now. Please share this info - mass adoption will be one of the key aspects to a successful Bitcore project. Follow me @xwerk for news and updates on BTX, Bitcoin, other cryptocurrencies and art projects. That big drop is going to be interesting, I have a feeling the price will dip then recover after a few months. Yeah, definitly a good chance the market will behave like this. Then again, if most people expect this to happen it might dip even earlier or maybe never. We'll see. Since I have close contact to the devs I am pretty convinced this is anything else but a pump-and-dump coin, so I'll just hodl and not stress out too much about possible short term hickups. thank you for this new post good sir. Regarding the post they made about the online registration at the start of October, we still do not see the online registration on the website (https://bitcore.cc/) to register our btx address. When will this be available good sir? Thanks in advance! It will be announced on all channels when there is an update on the matter, so don't worry, you won't miss it. I'll probably post a short info alert, too. Where did you get that info? It's not in the website. Please read my latest article. It has been changed to 0.5 : 1! Скажите пожалуйста всё время будут начисляться каждый понедельник 3%? Или есть какие то сроки?